How to generate a concordance? The results can be sorted and filtered, frequencies can be calculated. See Working with concordance results More precise search criteria can used by following the information below. Watch this short You Tube video to see how you can generate a concordance in Sketch Engine. Click (2) Query types and/or Context and/or Text types links to unfold the related options. Click Query types to unfold a list of available queries. Start typing into the required box, the type will be selected automatically and will be highlighted, the others will appear in grey. In the screenshot above the user decided to use the lemma search. if you type a word which contains a word form which is not a lemma, it behaves as the phrase search. if you search a word or phrase containing an apostrophe, you have to type the part with the apostrophe separately. if you search contracted negative forms, the apostrophe is not separately. will find the exact word form as it is typed, i.e. goes will only find examples of goes but not examples of go, went, going, etc. Activate the context options by clicking the Context link. The context options can be used together with Query types and Text types options. The part of speech filter can be used to include or exclude certain parts of speech from the context of the word. 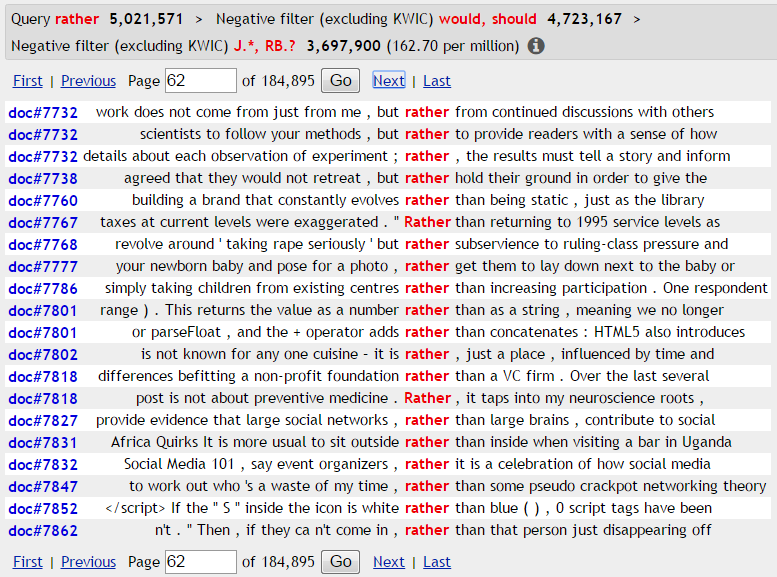 In the screenshot, the user excluded adverbs and adjectives one token to the right of rather. To exclude the rather numerous examples of rather than, it would be necessary to use CQL or to use additional filters on this result screen. Documents in a corpus can (but do not have to) be annotated (labelled) with information indicating the type of text, time of publication, purpose etc. Different corpora contain different type and different quantity of annotation. 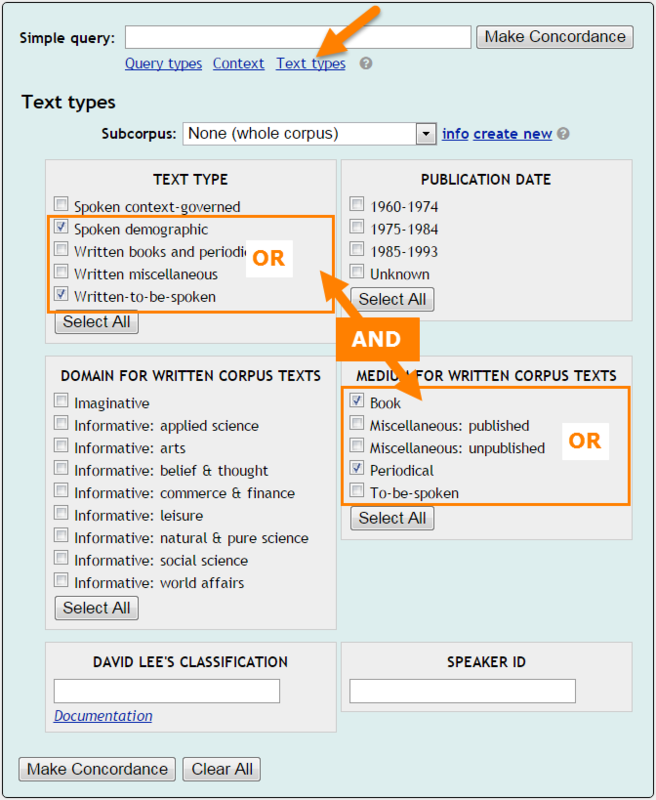 Corpora without this type annotation will not display any text type options to select. Constraint on a subcorpus has an effect on the resulting size per million, see what causes the difference in size per million when using Text Type vs. a subcorpus.